A wide variety of rays inhabit our oceans and even some bodies of freshwater. 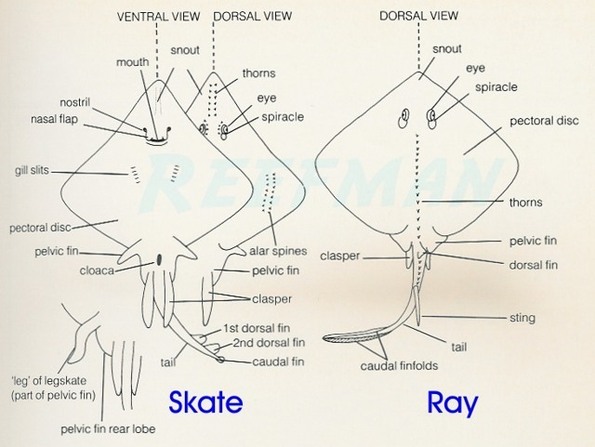 Rays are fish and they are similar to sharks in that their bodies are supported with cartilage instead of bone. All rays have a flattened shape, with large, rounded pectoral fins fused to their bodies and heads. Most rays swim using their pectoral fins, either by waving them in an elegant, wave-like motion or by flapping them like a bird. Rays are either bottom feeders or filter feeders, rooting for crustaceans and mollusks buried in the sand or using a sieve-like filter to strain plankton from the water. Stingrays are probably the most recognized type of ray. They are most easily identified by their elongated, thin tails with barbed stings. Most stingray tails have venom glands, which inject an incredibly painful toxin when the sting is used. Thankfully, stingrays only sting out of self-defense. A diver is unlikely to be stung by a stingray unless he causes the creature to feel threatened (a.k.a. this threatened situation was the direct cause of death of the late Steve “the Crocodile Hunter” Irwin). Stingrays may also be identified by their characteristic diamond shape and by the fact that they are frequently found half-buried in the sand rooting for food. Many rays spend the majority of their time on the sea floor; however some Stingrays such as Spotted Eagle Rays, are more commonly observed free-swimming. Stingrays are ovoviviparous meaning that their eggs develop & hatch inside the mother, who then gives birth to live young. These rays can be found in all parts of the world, even in fresh water. Commonly recognized species of stingray include the Southern Stingray, the Spotted Eagle Ray and the Blue-spotted Stingray. Although they do not have stingers, Manta Rays are technically a type of stingray, they have simply lost their stings through the process of evolution. Manta Rays can be easily identified by their great size. The largest Manta Rays have a wing spans up to 25 feet and weigh as much as 3,000 pounds. Despite their size, Manta Rays are not vicious predators. They filter feed and have large padded lobes on either side of their heads to direct food into their mouths. Manta Rays are incredibly graceful underwater and can move quite quickly with seemingly effortless movements of their pectoral fins. Manta Rays even breech occasionally, leaping from the water and back-flipping in the air. 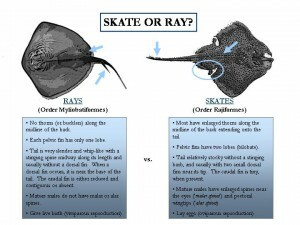 Skates appear quite similar to stingrays, but there are a few differences between skates and rays that divers can use to identify a skate underwater. Skates do not have stings. Instead, they have sharp barbs along their spines or on their tails for defense. 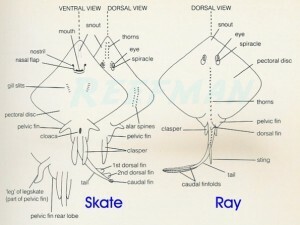 Skates also have wider tails than stingrays, with small fins near the tip of the tail. Finally, skates are round or triangular-shaped with elongated noses as opposed to the typical diamond shape of most stingrays. 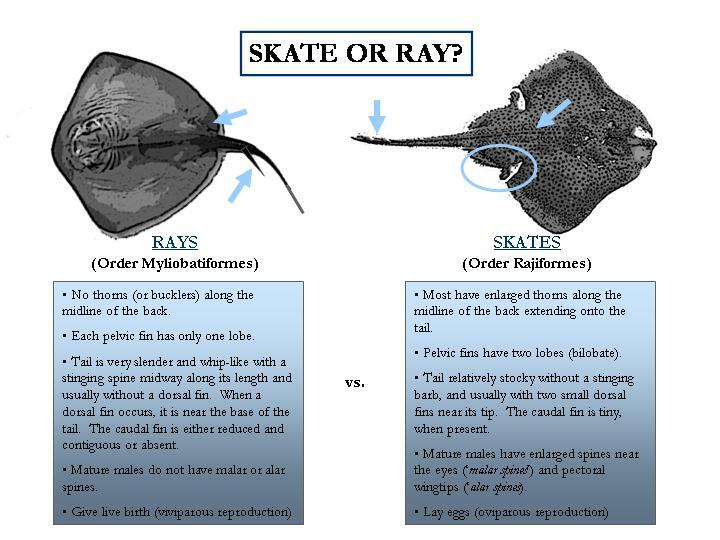 Skates have a different reproductive cycle than stingrays. Stingrays are oviviparous, while skates are oviparous, meaning that they lay eggs which hatch outside of the female’s body. Skates are only found in marine habitats. Electric Rays have a different form of defense from other rays. Stingrays sting, skates defend themselves with barbs and Manta Rays are too large to have any natural predators. Electric Rays are smaller than many other types of rays and do not have barbs or stings. Instead, they stun their prey with electric shocks. While all rays have a highly developed electric sense, Electric Rays have special electric organs on either side of their heads. These organs can generate between 50-200 volts and 30 amperes of electricity, enough to shock or injure a human and definitely enough to take out small prey. Electric Rays have such an acute electric sense that they are thought to be the most electrically sensitive of all animals. Electric Rays are usually 1-6 feet in diameter and have a more rounded shape than other rays. They have rounded dorsal fins and thick tails. Unlike other rays, Electric Rays use their tails to swim, not their pectoral fins. Electric Rays are found at many depths, from shallow waters to as far as to 3,000 feet below the surface. Rays are easily identifiable by their unique shape and behavior. While all rays have flattened bodies, the type of ray can frequently be distinguished by its body shape (round, diamond, or triangular), its method of swimming, thickness of its tail and the presence of stings or barbs. While rays are not aggressive towards divers, a diver should never touch a ray. At best he will frighten it away, at worse he will receive a nasty sting or painful electric shock. To clarify, Chimaeras (keye-meer-uh) are not elasmobranchs. However due to their similar life-history characteristics, vulnerability and close relation to elasmobranchs they are discussed on this website. Chimaeras are known as “chondrichthyans” or species whose skeletons are formed from cartilage as opposed to bone. The term chondrichthyans is also used to describe all sharks (Elasmobranchii), skates and rays (Batoidea) and chimaeras (Chimaeriformes) species. Chimaeras are also known informally as Ghost Sharks, Ratfish, Spookfish or Rabbitfishes. The closest living relatives to chimaeras are sharks although in evolutionary terms, they branched off nearly 400 million years ago. They are believed to be the oldest and most enigmatic groups of fishes alive today. These fish are typically confined to deep water however a few species such as the Pacific Spotted Ratfish can be found in shallow, inter-tidal waters. 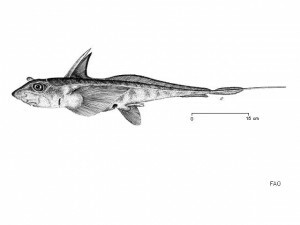 Chimaeras like sharks, posses several biological characteristics that make them vulnerable, such as very slow-growing, produce few young, late to attain sexual maturity and are long-lived. While there not many species of chimaeras in the Pacific Northwest, they are a common by-catch (about 700 tons per year) within the commercial trawl fishery for skates. Since Ratfish are of no commercial value, they are discarded at sea. As such, rates of discard mortality remain unknown.